Because the trip took me through St. James Park beside the cathedral, I’m glad I decided to walk to the subway from my meeting yesterday, despite my inappropriate shoes. I won’t dwell on how I suffered. 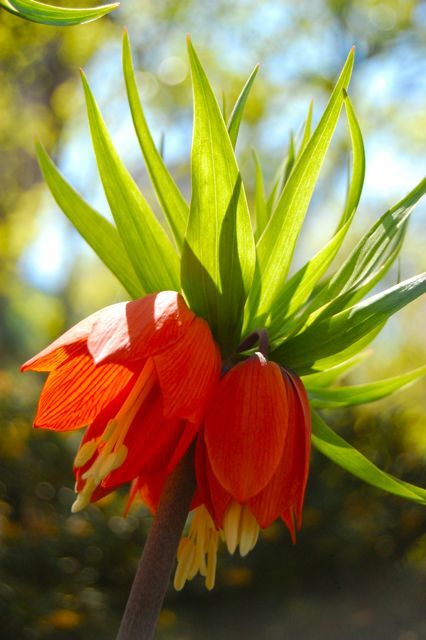 Instead, I’ll wax mildly poetic about Fritillaria imperialis, the crown imperial fritillaria. What an exotic bulb this is, with its pineapple-like tuft of leaves atop pendant orange (or yellow) bells with their prominent white stamens. Even the stems are decorative; a mottled purple. Here, I’ll risk using the extra-large photo feature. They really are worth a close look. Perhaps the only demerit against crown imperials is their scent, if scent we can call it, which is rather skunky. In a large garden, that might not be a problem. In a Microgarden like mine, it could be a little oppressive. So great to know that all I’ll need to do is head down to King and Church Streets for a bit of a fix. Crown imperials are a relation of the pretty checkered lily (much nicer name than the snake’s-head lily, by which it is also known; see the link below for other history details from Paghat’s Garden). We saw an enviable display of checkered lilies or Fritillaria meleagris in Barry Parker’s garden last Sunday (pictured here). Crown imperials like a well-drained soil, good sun, and not too much moisture. Checkered lilies, on the other hand, prefer the semi-shade and moisture of woodland gardens. 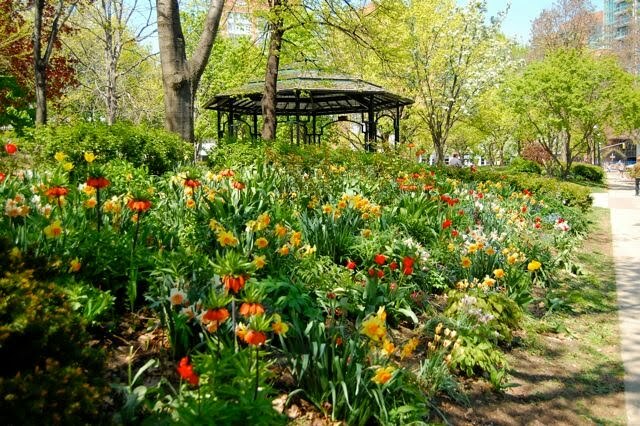 At one time, the St. James Cathedral gardens were a project of the Garden Club of Toronto. Unsure if they’re still maintaining the spring display, which is pretty spectactular at the moment. 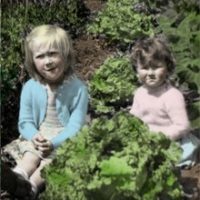 If you happen to be downtown, take a walk and grab some ideas for your own garden. It isn’t too early to be making lists for next year. I love crown imperials…I wish they were a little less expensive because I would love to do a mass planting of them in my parents' frontyard. I agree about the smell of crown imperials – such a pity! One place I know grows them in their lawn some distance from the house and that works well. 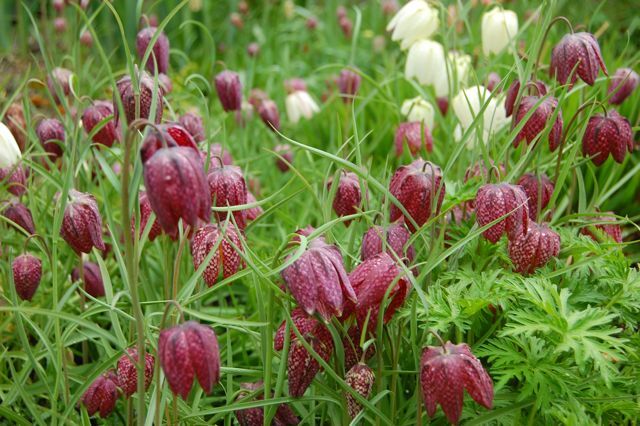 The snake's head fritillary is fabulous -you just can't grow enough of them! In my part of the world there are still a few meadows left where they grow wild in their thousands. A spectacular sight. By the way, I was in Cirencester yesterday! As much as I love the snake's head fritillary (and I do!) 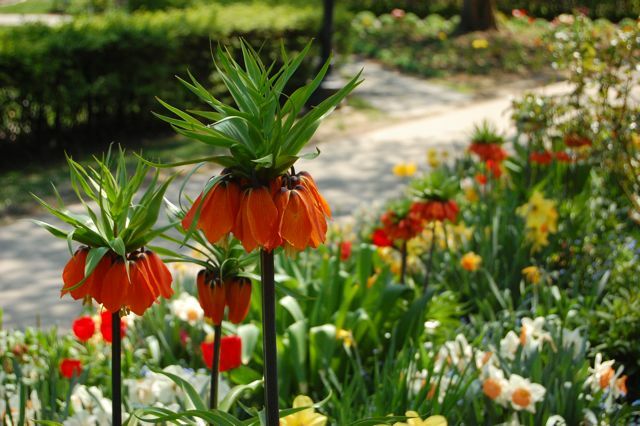 I also love the crown imperial–it's orange, how can you go wrong?! What a beautiful walk! Those bulbs really do look tropical. Wow – those are SO COOL. I have a thing for orange flowers. I had never heard of fritillaria until I bought a bag of the checkered bulbs last fall. Unfortunately, nary a one I planted came up. Probably because of the very wet winter with all the melting snow. They're so neat though, I might try again this fall. These are so gorgeous. The gardens in St. James Park are always beautiful. Thanks for showing us the beauty. spring looks amazing with these imperials.i love the blooming stand in all those colors and huge numbers blooming at once! I have never grown those ones and they look so amazing : ) I know there are so many gorgeous garden displays going on in Toronto with Spring POPPING out every where now ! .. Hopefully these couple of rain days will quench the fears of a long hot dry summer predicted ?